The Defense Advanced Research Projects Agency (the same people that brought you The Internet) is going to be moving from their unphotographable building on Fairfax Blvd in Ballston to a new facility, pictured above, which will probably also be unphotographable in Ballston, across from the Mall. The new building will be the first, when it opens in 2012, to fully align itself with the Department of Defense anti-terror construction guidelines. This will keep 800 DARPA jobs in Arlington, as well as 1,700 liaison jobs for other companies in the Northern Virginia area. Thanks for The Internet, DARPA! It’s a great series of tubes! The new building is there now, but you cannot see it due to the cloaking device they employ. @john parker: It’s cleverly masked as a dilapidated, recently-abandoned bus garage from 1945. DARPA is currently in VA Square not Ballston. Wonder how they’ll manage the 24 hour armed prescence when next to a mall. True, it’s pretty much VA Square, but I always forget that neighborhood for whatever reason. Seems superfluous to have an extra designation between Clarendon & Ballston. Agree that VA Square has become a bit of a waste of a neighborhood distinction. I’m trying to start a trend of referring to it as “East Ballston”. 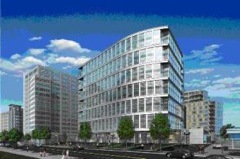 But the current DARPA building is right beside the VA Square Metro. Now for the most important news here: The new site for DARPA is where Super Pollo currently is. Super Pollo is the best restaurant on earth. I am beside myself with grief…I hope they are moving it to the ground floor of my building though. I remember hearing about this awhile ago and thinking about all the raging DARPA happy hours they’ll be having at Baileys.